For Reading Comprehension, Part D of the SAT French Subject Test, you will have to read passages in French and answer critical questions. You will have anywhere from 4 to 6 literary or journalistic passages, each about 20 to 30 lines. In addition, you may see 1 to 3 ticket/schedule/advertisement-type texts; these may or may not be accompanied by pictures. There is no clear order of difficulty in this section, so you will have to use your judgment to determine which questions you are going to answer. It is best to read the questions first so you have a better sense of what to look for as you read the passages. The passages are generally quite short. Read them through at a moderate pace to get the general idea of what the passage is about. Do not become obsessed if you don’t understand every word or sentence, and keep an eye out for trap answers. Get acquainted with the format of the test. Follow the suggestions we give you and then try the practice section at the end of this chapter. Do not be anxious about this section. There is no clear order of difficulty, so just go to the next question if you find something too difficult and then go back if you have time. The short passages are not necessarily easier than the long ones, so make sure you choose wisely. Reading the questions first will give you an idea of what you are about to read and what to look for. Use the fact that the questions are in roughly chronological order to help you find the answers in the passage. go in order of the text. Once you have an idea of what the answer is, go back to the passage and make sure you are not falling for a trap answer. Reread the entire sentence or group of sentences that relate to the question to make sure you have evidence for your answer. You can eliminate answers that don’t make sense in the context of the passage. Sometimes the words in an answer choice will be strongly reminiscent of the words used in the passage. If a word or phrase is directly lifted from the passage, be careful—you may be falling into a trap. Sometimes, instead of repeating words verbatim, the College Board will take a word and twist it subtly. For example, if the word errer appears, they might have a trap answer choice containing the word erreur. What Is This Weird Tense? In formal French, literary writing uses a tense called the passé simple (or past historic) instead of the passé composé. You don’t need to know how to conjugate it or when to use it. You simply need to recognize which verb is being used. Try the following passage, looking for the types of trap answers mentioned above. Directions: Read the following selections carefully for comprehension. Each selection is followed by a number of questions or incomplete statements. Select the completion or answer that is best according to the text and fill in the corresponding oval on the answer sheet. 2. Qu’est-ce qui rend la cité différente des autres villes? 4. Comment réagissent les habitants de la ville à l’arrivée de l’été? (A) Ils font des feux. (C) Ils restent à l’intérieur. (D) Ils deviennent des voleurs. (A) “an ideal town” is a misunderstanding of the first sentence. The first sentence tells us that the city is ugly, and the passage goes on to list primarily negative qualities. Eliminate this choice. (B) “a marketplace in town” is an example of familiar words / wrong context. The word marché appears, as does the word vendeurs; however, the passage as a whole is not about the market. This choice is too specific. Eliminate it. (C) “the changing of the seasons” is another example of familiar words—wrong context. The change of seasons is discussed, but again, it is too specific for this question. (D) “the principal attributes of a town” is the correct answer. The passage discusses several distinctive features of a city. You are asked to choose what makes the city different from other cities. The answer is in the section that starts with the second sentence of the passage. (A) “the presence of pigeons” is an example of familiar words—wrong context. Pigeons are mentioned, but what is significant is their absence. (B) “the latitude” is another example of familiar words—wrong context. The word “latitude” appears in the second sentence, but it is used to describe the location of other cities, in any latitude. (C) “the lack of greenery and birds” is the correct answer. Notice that it paraphrases part of the third sentence: sans pigeons, sans arbres et sans jardins. (D) “the color of the sky” takes the word ciel out of context. It is a misunderstanding of the sentence: Le changement des saisons ne s’y lit que dans le ciel. You are asked to interpret the sentence “it is a spring that is sold in the marketplace” within the context of the passage. (A) “that one can buy everything at the market” is too literal and does not relate to the passage. (B) “that one knows spring has arrived when one can buy flowers” is the correct answer. It corroborates the meaning, connecting it to the previous sentence about how few signs there are of the change of seasons. 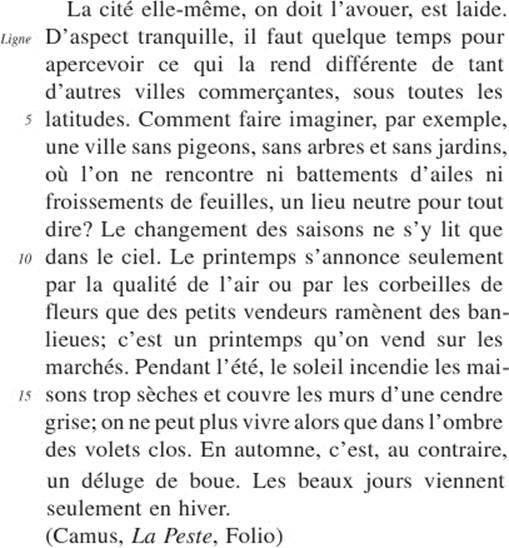 (C) “that it is easier to see the spring in the suburbs” takes the word banlieues out of context. (D) “that spring is like a marketplace” is a literal interpretation. “How do the inhabitants of the town react to the arrival of summer?” This topic is discussed in the third-to-last sentence of the passage. (B) “They complain” comes out of the blue. Complaining is not discussed anywhere in the passage. (D) “They become thieves” is an example of a misleading look-alike. Here the word volets (shutters) has been twisted into the word voleurs. These graphical passages can be a blessing because you have less to read and because common sense works so well. Pay special attention to the small print. · Read through the schedule or advertisement. · Get a sense of the layout. Read all sizes of print. · Use your common sense. · Eliminate misleading look-alike words. (A) “are from a classic collection” takes a phrase out of context. The company produces a traditional line, but these styles, in contrast, are modern. (B) “cost a lot of money” is also out of context. Argent is used here to mean “silver,” not “money.” This answer could be true, but there is no evidence of it in the ad. (C) “have a good reputation” is also out of context. Again, the company is renowned, but we don’t know about these specific lines. (D) “are of a contemporary design” is the correct answer. Notice that it paraphrases the actual description des créations de notre temps. Le bon à découper vous offre refers to the coupon in the corner. (A) “free products” is a familiar word, but it’s in the wrong context. The catalog is free; the products are not. (B) “a choice of catalogs” is the correct answer. The two boxes name two types of catalogs. (C) “addresses” is a familiar word—wrong context. Adresser is part of a request to the company to send or address a catalog to the reader. (D) “a description of new lines” is not terrible, but is not as good as choice (B). The coupon itself is not providing an actual description of the contemporary lines. 2. Selon le passage, pour quelle raison Etienne est-il fatigué? (A) Il a trop mangé. (B) Il n’a pas dormi du tout depuis deux jours. (C) Il s’est couché à quatre heures du matin. (D) Il n’a dormi que quelques heures en 48 heures. 3. A quel moment de la journée s’est-il réveillé? 4. Comment réagit-il au moment de se réveiller? (A) Il ne se souvient pas où il est. (B) Il ne trouve pas ses habits. (C) Il se sent en retard. 5. Que voulait-il faire avant de dîner? 6. Quand Morissot partait-il pour l’île? 8. A quel moment commençait-il à pêcher? 9. Qu’est-ce qui se trouvait dans la rue Notre-Dame-de-Lorette? 12. Quelle raison Guillaume donne-t-il pour ne pas mentir à ses parents? (A) Ses parents le laissent faire n’importe quoi. (B) Ses parents lui donnent la responsabilité de décider que faire. (C) Il vaut mieux ne pas le faire. (D) Ses parents n’aiment pas le cinéma. 14. Qu’est-ce qu’on trouve près du Luxembourg? 16. 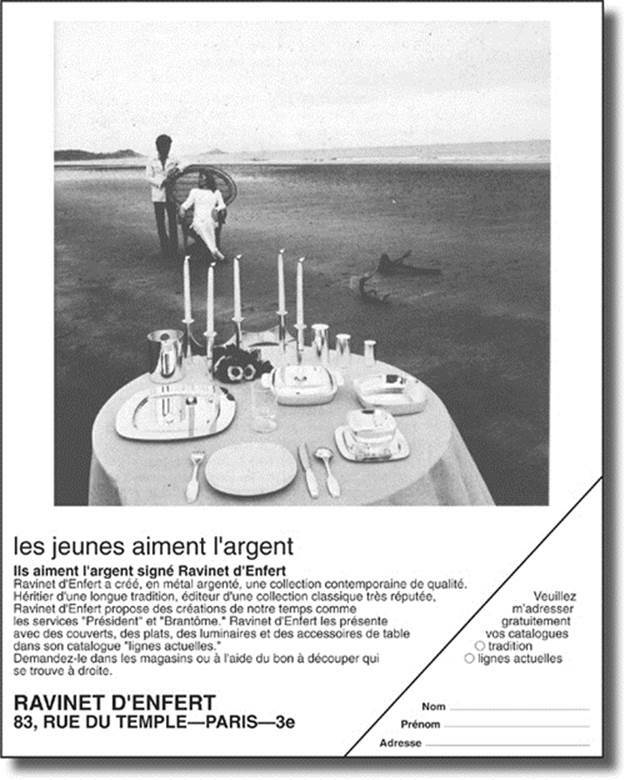 Que font les jeunes au lieu d’aller au boulevard Saint-Michel? (A) Ils fréquentent la place Saint-André-des-Arts. 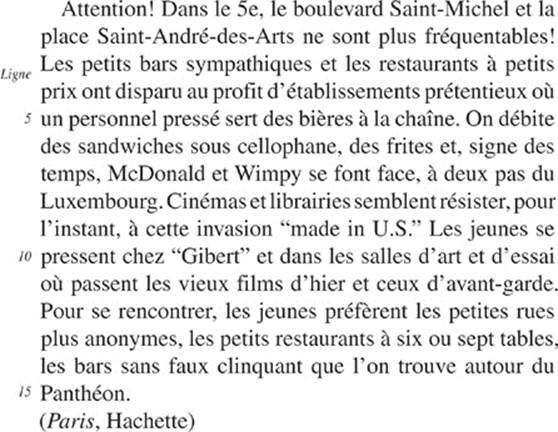 (B) Ils sont pressés d’aller voir des films américains. (C) Ils cherchent des bars sympathiques dans un autre endroit. (D) Ils résistent à l’envie d’aller dans les librairies. 20. Après six ans, qu’est-ce qui s’est passé? (A) Le mari de la narratrice est parti. (B) Le beau temps a changé. (C) La narratrice a décidé de partir. (D) La narratrice a trouvé un amant. 22. Qu’est-ce que les voisins pensaient de la maladie de Lemurier? (A) Ils attendaient une fin intéressante à la tragédie. (C) Ils étaient fâchés contre Lemurier. 23. Selon les voisins, qu’est-ce qui serait “un dénouement … digne” de la situation? 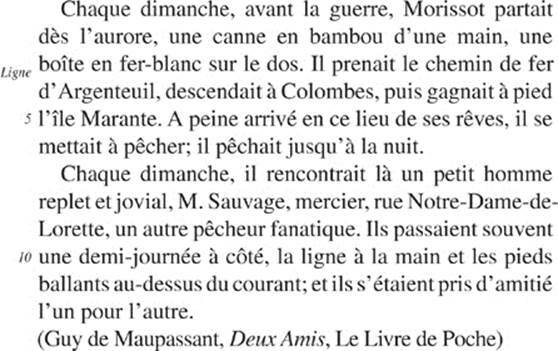 (A) M. Lemurier perd son travail. (B) M. Lemurier récupère complètement. 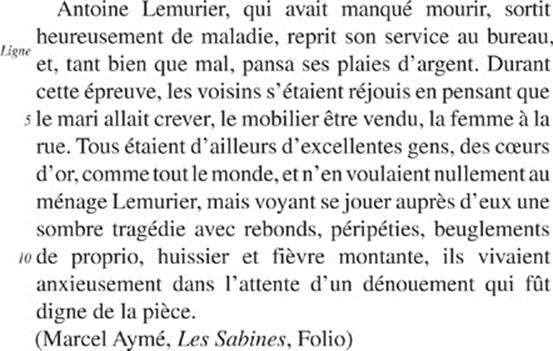 (C) Mme Lemurier est sans abri. (D) Mme Lemurier vend la maison. · Memorize the instructions to save time on test day. · Read the questions first so you know what to look for in the passage. · Read and eliminate wrong answer choices. · Do not get stuck on difficult passages or questions. Move on and come back later if you have the time.